Here are my simple 5 top tips. No screens at least 1 hour before bedtime. Plan for fun non-screen activities. Encourage children to switch off devices on their own. There’s a strong body of research from the National Sleep Foundation that suggests that iPads, iPhones and tablets emit a strong blue light, which can harm your child’s ability to fall asleep as it buzzes them up before bedtime. So, make it a habit in your house for everyone to turn off before bedtime so busy minds can start to relax and unwind and keep them out of the bedroom overnight. Kids really need their sleep. Screens in the bedroom – especially in the hour before bedtime – interferes with the entire process of winding down, preparing for rest, and waking up refreshed and ready to tackle the day. Amazing things happen when families choose to keep devices away from the dinner table. Don’t nag about eating the broccoli and holding the knife and fork properly ( all the time!) make it a fun time to chat, engage & be involved with your kids. Why not go around the table ask everyone to share one good thing that happen that day & voila you’ll have – better behaved kids who enjoy leaving their screens in the cupboard & you’ll build happier memories for everyone. Don’t let the internet bring up your children. Stay involved, interested and ‘Talk and Teach’ them online safety. Get curious about what videos your kids are watching, what makes them laugh, what music they like and why they admire those YouTubers they are avidly following. The internet is a great way to stay up-to-date on the news, do research for school projects, and communicate with friends, but it can also be very dangerous place so keep up to date. Be your child’s parent – NOT their friend & be their Media Mentor by having some family rules around screen time – balance not ban! One of my ideas for #FamilyFun is to try ‘ING’ activities from bowlING, cookING, bakING, craftING, dancING, cyclING, talkING, listenING, readING – you get the idea! Make coming of technology compellING. Don’t nag about coming off ‘Fortnite’ to do Maths Homework ! Make coming off fun and enjoyable. Build in new traditions – like bike ridING on Saturday mornings, board games on Sunday afternoons – failing to plan, is planning to fail. So, just plan a simple new routine away from screens and watch the magic of chatting and laughing come back into your family. I think this simple little tip is really important as it teaches your child to take responsibility for their own screen use. By switching their device off themselves they are learning to self regulate. Don’t ‘do a Kirstie Allsopp’ who bashed up and broke her kids’ iPads in a fit of parent pique. Teach your kids about your media rules, be consistent and create good long term digital habits. 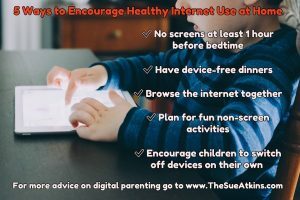 The post 5 EASY Ways to Encourage Healthy Internet Use at Home – Balance not BAN. appeared first on Sue Atkins The Parenting Coach.